Thanks to the water conservation efforts of our City's residents and those throughout the State, along with near average rainfall this past winter in the nortehrn area of the State, the State has provided an avenue to relax the required conservation efforts by the City. WATERING DAYS ARE NO LONGER IN EFFECT. All other "good housekeeping" restrictions remain in effect. The Public Works team appreciates your efforts to mak ethis possible, and your continued dedication to conserve water! If you have any questions, please contact our water experts at 760-337-4538. DO NOT ACCEPT ANY NOTICES OR CITATIONS FROM ANY INDIVIDUAL THAT CAN NOT IDENTIFY HIM OR HERSELF AS A CITY OF EL CENTRO EMPLOYEE. Most of the water will evaporate. Do not allow water to runoff into the gutter. Concrete and asphalt do not grow. Please do not water them. How to conserve water: Adjust your sprinkler system and sprinkler timing so that there is no runoff onto the sidewalks or street. 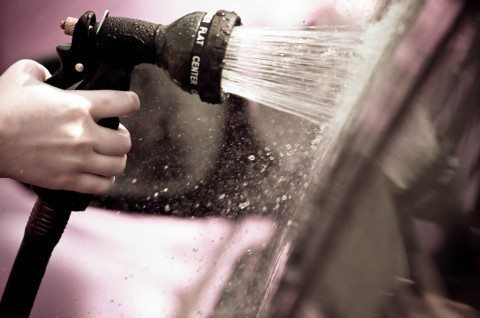 Use a hose with a shut-off nozzle when washing your car. How to conserve water: Use a bucket and only use hose to rinse the vehicle. Do not wash driveways and sidewalks with water. How to conserve water: Use a broom to clean your driveway. The use of potable water in a fountain or other decorative water feature without a recirculating system in prohibited. How to conserve water: Verify your fountain or water feature has a recirculating water system or install one.